Running away from the situation, Harry tries to plan his life as an outcast. Having seen a dark creature that is staring at him, Harry draws out his wand, only to find out that he just flagged down the Knight Bus. Harry learns about Sirius Black and Azkaban. The Knight Bus roams around the country until he reaches Leaky Cauldron, in London and only a few miles away from his point of origin. For the first time in his life, Harry is able to be in his own devices. He does some pre-term shopping, eats sundaes while doing his homeworks, and establish relationships with common wizardfolk. At the last day of the summer, the Weasleys return from their Egypt trip, with Hermione in tow as they stay at the Leaky Cauldron. At their first meeting, Crookshanks lunges on Scabbers at the Magical Menagerie. 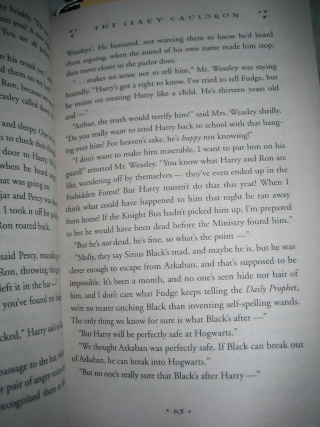 Harry overhears Mr. and Mrs. Weasley arguing about keeping the truth from Harry on Black's possible threat to him. Hundreds of witches and wizards use their wands all the time, with spells highly similar to the motion of flagging down vehicles, how does the Knight Bus distinguish which people are trying to get a ride from those who just does the usual wand-waving? Having said that it can go anywhere on land, can the Knight Bus go to "Unplottable" places as well? The twins trying to shut Percy in a pyramid seems to be out of good, plain, fun teasing. Are they going too far in this prank? These Azkaban guards stationed around school were the same guards which let Sirius Black get out of Azkaban. Why did the Ministry decide to choose the same ones? That's the exact same thing that I was thinking! How would they distinguish those who need a ride? Well, when Stan introduced the Knight Bus, he did say another prerequisite aside from sticking up a wand which is being stranded. Maybe being alone without anyone else around with luggage means being stranded. Maybe they have this special viewer that detects stranded (meaning alone) wizards with wands sticking out so that they would know beforehand that there is a passenger who needs to go somewhere. Ah, brotherly love! For ordinary muggle folks, that would have gone too far. However, wizards would have been able to overcome any prank with magic. Knowing how exceptional Percy is with magic, plus he's already Head Boy, he could have easily survived any prank from the twins. Moreover, Mr. and Mrs. Weasley would have easily opened the pyramid once they found out Percy was missing. Aside from the fact that no one has escaped Azkaban except Sirius Black, it was a prudent choice for the Ministry to choose them since I think there would have been no one else to guard Hogwarts 24/7 and leaving behind all their work. I am also speculating that since they have a specialized duty in guarding Azkaban, then they're more suited to guard Hogwarts. PS: I was wondering, when Mr. and Mrs. Weasley were arguing about something at the Leaky Cauldron, Molly stated that "You know what Harry and Ron are like, wandering off by themselves--they've ended up in the ForbiddenForest twice!" (PoA, Ch. 4). Harry has been in the Forbidden Forest twice (thrice if you included flying on a broom spying on Snape), but not Ron. Harry was with Hermione, Neville, and Draco the first time that he was in the forest, and the second was with Ron following the spiders. I don't know when Ron had a second visit at the Forbidden Forest. From what I read, it did not mention the word "twice" and if I'm not mistaken, it was Mr. Weasley who said it (paperback, p.65). Chapter 4, page 65, paragraph 4, line 4, word 3 (or 2.5) yung "twice". And, yes, it was Arthur who said it. Guys, if I may ask, what type of guards do you have in mind when they kept on mentioning the Azkaban guards? "Talk about summat else, Stan, there's a good lad. Them Azkaban guards give me collywobbles." ".. We had to ask him if he minds the Azkaban guards stationing themselves around the entrances to the school grounds. He wasn't happy about it, but he agreed." what type of guards do you have in mind when they kept on mentioning the Azkaban guards? Penny, I don't know if my eyes are failing me, but my copy does not have the word "twice" on it. From the sound of it, they seemed terribly scary. Letting my imagination run wild, I picture them being living corpses/zombies/mummies in guard uniforms... they'll certainly give me collywobbles too. Wala nga! Sorry. Which edition is this? Mine is the September 2001, first Scholastic Trade Paperback printing. Will check the library copies tomorrow. Ba't ganun? This is interesting. Oh I see, that clears the confusion. Thanks Jacq! @Penny, my edition is the same as yours, maybe from a different batch of printing? When it comes down to it, which side would you choose? Mister or Mrs. Weasley's? I know that the easier choice is to tell Harry the truth as what Mr. Weasley did but maybe Molly has a point? Thirteen is barely a high school student in the muggle world. What you don't know won't hurt you? I vote 70% Mr. Weasley, 30% Mrs. Weasley. In this case I think it is advantageous for Harry to know since he would be on his guard like what Mr. Weasley tried explaining to his wife. I also understand Mrs. Weasley's side. Like any other mother, she doesn't want to see Harry worry and by not telling him is a way for her to refrain from adding burden to Harry. She wants Harry to go to school and enjoy being a normal student for once. Her intention was good, but timing was not. She could let Harry be happy when they caught Black or when he's not in danger anymore. I don't know when they start treating a child like a young adult in the wizarding world, it's thirteen perhaps since Mr. Weasley mentioned Harry's age. I for one don't think it matters whether he's thirteen or not, for what's he's been though he doesn't act much his age, does he? He has already killed a basilisk when he was only twelve and that's not normal for a twelve year old. I think that the Ministry was banking on them being more familiar with Black, having guarded him for so long. Should he try to break into Hogwarts, they might be able to identify him more quickly than a guard who did not know Black. Thanks Prof! I was just intrigued by it since I know Ron has only been in the forest once so maybe someone in the forums knows anything about it, so I guess it was a mistake after all. I would also side with Mr. Weasley, since Harry keeps on discovering new things on his own, like when he stumbled on this conversation between Mr. and Mrs. Weasley so I guess Mr. Weasley assumed Harry would know the truth eventually and he wants Harry to be prepared for it. It pays to err on the side of caution. 1. Hundreds of witches and wizards use their wands all the time, with spells highly similar to the motion of flagging down vehicles, how does the Knight Bus distinguish which people are trying to get a ride from those who just does the usual wand-waving? Having said that it can go anywhere on land, can the Knight Bus go to "Unplottable" places as well? I think that it's not about wand waving but only the hand which you use to hold the wand to flag down the knight bus. Harry accidentally stick out his wand hand when he tried to break his fall. He didn't have his wand in his hand. "Just stick out your wand hand"
"Harry stepped backward. His legs hit his trunk and he tripped. His wand flew out of his hand as he flung out an arm to break his fall, and he landed, hard, in the gutter ---"
Stan even asked Harry if he did stick out his wand hand. "you did flag us down, dincha? Stuck out your wand 'and, dincha?" So it seems that it's similar to us Muggles when we stick out our hand to call the attention of bus/taxi/jeepney drivers. What's amazing is they know which hand is your wand hand. For the question whether or not the Knight Bus could go to unplottable places, then could it mean that Harry and Ron could have taken the Knight Bus to Hogwarts in Book 2 instead of flying the Ford Anglia? Perhaps they didn't have the resources/galleons to do so or was it more convenient to take the car than the bus? 2. The twins trying to shut Percy in a pyramid seems to be out of good, plain, fun teasing. Are they going too far in this prank? I'd say it's normal for the twins. I would not expect anything less esp. pranks from the Weasley twins. 3. These Azkaban guards stationed around school were the same guards which let Sirius Black get out of Azkaban. Why did the Ministry decide to choose the same ones? Like what Allan mentioned, they're perfect for the job. In addition, they made a mistake by letting Black escape so they have to make up for it.